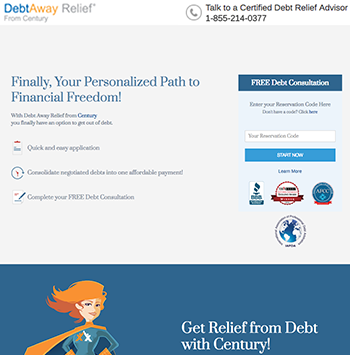 DebtAway offers debt relief services to consumers struggling with unsecured debt over $3,500 through their industry-standard debt settlement program (backed by their negotiation partner company Century Support Services). Since 2006, DebtAway Relief has offered their accredited debt relief services to consumers looking for quick and efficient debt settlement. DebtAway is a newer company and not as established or experienced as industry debt settlement leader Freedom Debt Relief. Signing up is simple. You only need to call or fill out a single application for a 100% free debt consultation to see if you qualify for DebtAway's settlement and loan services. If you do, your debts are consolidated and negotiated into one single payment. To save up for this payment, you need to make a monthly deposit into a special purpose account that you have full access and control over. DebtAway's debt relief advisors take note of your growing balance to negotiate debt settlements for you. Since they have experience dealing with almost every creditor in the industry, DebtAway Relief employs the best tactics to negotiate with creditors with the goal of maximizing the discount on your accounts. Once this happens, they contact you to review and receive your final approval to complete each transaction. After your debts are settled, your creditors must report the settlement to the bureaus. Once you have completed the program, you will be debt free. Significant potential debt savings: On average, DebtAway achieves settlement rates of $0.50 to $0.60 on the dollar (but specific results will vary depending on your situation). Highly accredited service: Debt Away is BBB (Better Business Bureau), AFCC (American Fair Credit Council), IAPDA (International Association of Professional Debt Arbitrators) accredited. Lower minimum debt requirements: DebtAway has a minimum debt requirement of $3,500, which is much lower than the industry standard of $7,500 to $10,000. Additional services: After consumers have completed their program, DebtAway offers the Reload Loan through their sister company New Credit America, which allows consumers to consolidate their debts or as an installment personal loan. DebtAway Relief does not have the debt negotiation experience of established companies in the debt settlement space like Freedom Debt Relief. Therefore, DebtAway may be slower to resolve your case and their negotiators may not be able to achieve the same level of debt reduction results. DebtAway's site lacks transparency in regards to the time frame and additional details of their debt relief services. Their services are only available in 26 states. DebtAway's fee is 25% of your initial enrolled balance, which is about average for the debt relief industry. Competitors like Freedom Debt Relief may have lower rates, which can ultimately save you more money and result in a shorter debt repayment plan length. The DebtAway loan product from New Credit America (a debt consolidation program that funds settlements with your creditors) is offered at a fixed rate of 29.7%. There are no other fees involved in the DebtAway loan (named the New Credit America Reload Loan), and no origination or pre-payment penalty fees. The Reload Loan is structured as a personal installment loan that reports to the credit bureaus (which can improve your credit score as you repay the loan). What is the minimum debt needed? The required minimum debt needed to sign up is $3,500. DebtAway's debt settlement fees are a flat 25% of your initial enrolled balance. What information does DebtAway need from me when I enroll? You will need to provide basic personal information that includes your name, phone number, email, date of birth, address, social security number, employment information, income, and proof of income. What kind of debt can I enroll? DebtAway accepts several types of unsecured debt: credit card debt (current or delinquent), medical debt, payday loans, installment loans, collection accounts, business debt (as long as it was opened under the client's social security number), automobile repossession deficiency balances, and private student loans. How can DebtAway reduce my debts? Once you have enrolled your debt into the program and made 7 to 8 months of successful monthly payments, you may be given the opportunity to further consolidate all of your negotiated debt through DebtAway's "graduation loan" from their partner company New Credit America. This DebtAway loan effectively pays off all your debts and your new monthly payment goes directly towards DebtAway. If you qualify for this consolidated loan, you don't have to pay an origination fee but you will have to pay a slightly higher interest rate. How can I contact DebtAway Relief? For a free initial consultation, you can call at 1-855-214-0377. Any assistance or additional questions can be found via email at [email protected] or their toll-free number 1-855-214-0377.